The best things in life are free. 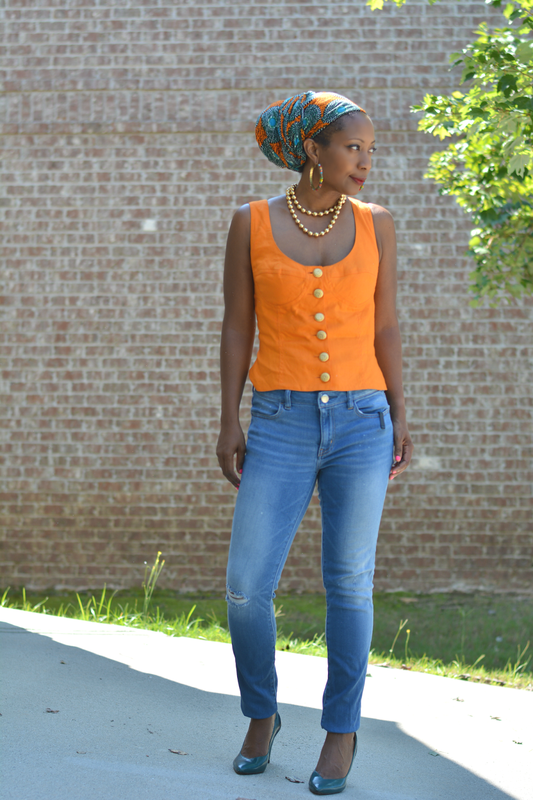 These new to me jeans are from my mama's closet. My mom came for a visit and dropped all a few pairs from her hoarder like stash of denim. I've been meaning to replace the ones that no longer fit but I blew my loosey goosey thrift budget up this summer! More so than usual. This is my first pair of distressed denim. I've never purposely added holes to my jeans. Nor have I bought them that way. It's one of those repeating trends that I wasn't able to get into. When they're free though, I'm down. 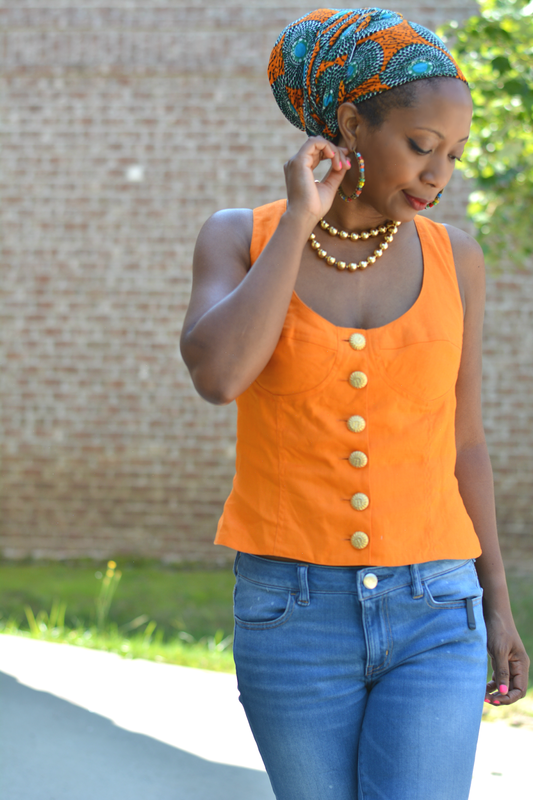 I paired the jeans with an orange bustier top that I thrifted awhile ago. 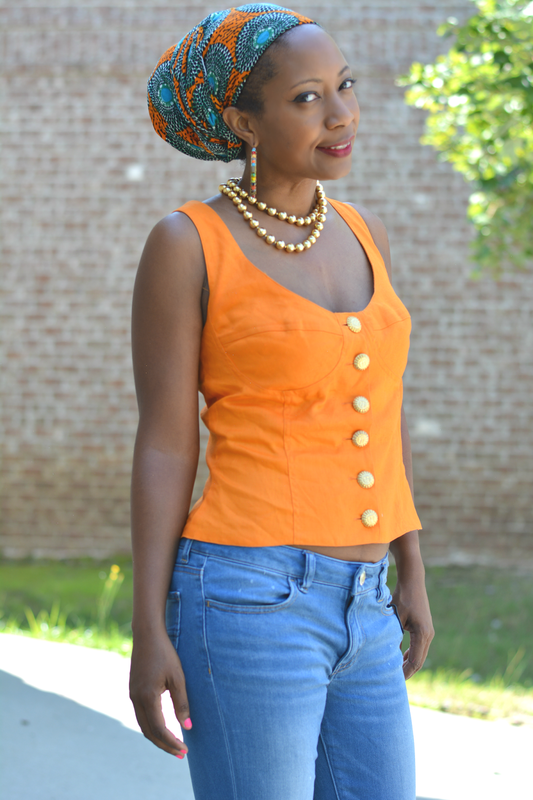 I loved the bright orange color and the cute sun in splendor buttons. I haven't worn it all summer because it's linen and requires ironing. I put it on today sans iron and I have just enough skin to stretch some of those wrinkles out. The steamy heat took care of a few more. I certainly didn't need a closed toe shoe today but my brain is shifting to fall mode with the falling leaves and V back in school. It's still very much summer and pools of sweat still collect in vintage pumps. DIY heel tips are still holding up though. My necklace is from huge bag of jewelry I bought at an estate sale. A couple of years ago, it reminded me too much of mardi gras beads so I never wore it. Today I'm kinda digging them. My fashion tastes remain fickle. All together they represent my style philosophy. Whether free, cheap, old, or secondhand, it doesn't matter. Wear what you like and you're always in fashion.